Day one at the Community Vilaj began with the registration of community participants and a special "Making Connections" process, which brought together and introduced all participants and facilitators. Please click here to see photos from Day One. After the introductions, Jane Cook from Papua New Guinea proceeded with a traditional blessing of the space. This moving ceremony touched on the importance of local knowledge and experience and provided an opportunity for reflection and contemplation at the beginning of what will be a hectic and very exciting 8 days at the Community Vilaj. 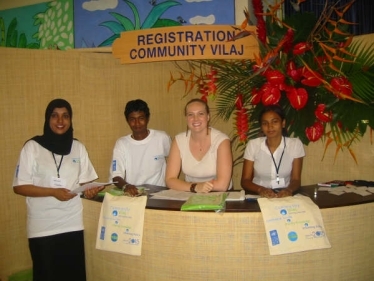 Human resources involved in the preparation of the Community Vilaj and the SIDS Conference as a whole. 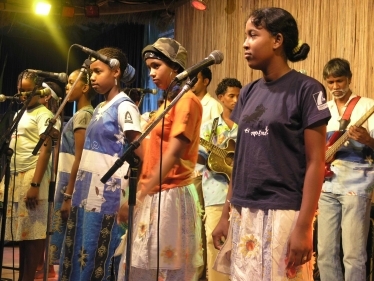 Description of the themes and agenda of the SIDS community. Recognition of the participants efforts in participating in the conference and contribute to the improvement of sustainable development. Ways and means to work together and build a community of resilience to be able to respond positively to challenges to economic, social and cultural development. 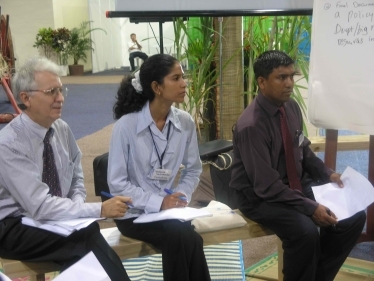 An overview of the whole Conference programme was given by Equator Initiative's Adam Pollet, who expanded on possibilities for interaction between Community Vilaj participants and the government officials and dignitaries attending the SIDS Conference. What you want to bring and share? Not only success stories but also the common and specific problems overcome by communities in trying to contribute to the improvement of life in SIDS. What would you like to learn from others? How to improve relationships between communities and governments to be able achieve the important goals set by civil society and governments themselves, including the MDGs. What should this Conference and the Community Vilaj achieve? Women's empowerment and effective gender balance in policy decisions. Recognition of community contributions and initiatives, and support by governments during policy decisions and the setting up of programs. Incorporation of policies that will stop exploitation of SIDS resources by developed countries. Development of a common regulatory framework for ensuring equal opportunities for all SIDS to take optimum advantage of their limited natural resources. In the last part of the morning session, Esther Mwuara-Muria - of GROOTS (Kenya) - and Sunia Delailagi - of FLMMA (Fiji) - shared their local experiences on the role of women as an entry point for sustainable development. They also spoke passionately bout the networks they had established between civil society and government respectively. In the afternoon presentation, CODEPA, a local NGO from Mauritius, gave a moving presentation on its ongoing efforts to support community-based educational programmes and related projects. This presentation sparked considerable discussion and provided and excellent introduction to the efforts of civil society organizations in Mauritius to forge a more sustainable future. Participants from all communities then took the opportunity to set up posters and materials to display their work. The speeches by the dignitaries and community representatives were followed by a series of exceptional Mauritian cultural performances and a reception. At the reception participants were able to wind down from a busy first day and cement new contacts and friendships.